Karen has been involved in Tae Kwon Do for over 22 years, her first belt was earned in the East West system which blends Tae Kwon Do, with jujitsu and aikido. She also holds 4th degree certification from the Kukkiwan and has taught for over 17 years, earning her 5th degree in Jidokwan Taekwando with Grandmaster Suggs in 2014. 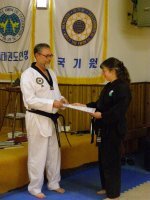 She recently earned her 4th degree from the Kukkiwon and is credentialed to recommend dan certificates through the Kukkiwon. She also designed the program used to teach senior/adaptive Tae Kwon Do at Coquille Martial Arts. 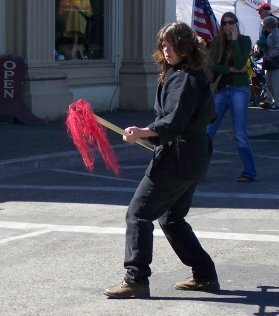 In addition, Karen teaches the Tai Chi classes; beginner, intermediate, advanced and weapons in Coquille, and teaches kids & adult weapons. She also participates in and helps teach the systema study group. At demonstrations, she is usually found at the mike, extolling the virtues of her students. In order to further her martial arts studies, Karen attends the annual Pacific Martial Arts Conference in Eugene and other seminars. She is also the school's business manager and does the majority of updating the website. When not at the dojo, she can be found working with dogs and garden, hiking and wildlife watching. She also likes to read and work online and spend time with her family, husband of 38 years, Jim, 29 year old son, Dane and mom, Peggy Cooper. In addition to her black belt, she holds an AA in studio art and a BA in Art history as well as having earned K-6 and 6-12(Literature and Art) teaching credentials and she homeschooled her son, Dane in grades 6-11 at which time he earned his GED and a scholarship to SOCC. She exhibits her art and photography at the Coos County Fair. 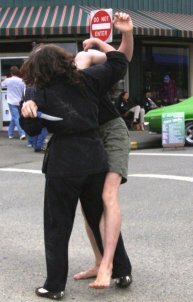 Karen performs a spear form , demonstrates a knife disarm, and a systema takedown.